Course Description: Injection Molding Fundamentals is a two lesson 3-4 hour training program that teaches your personnel the most important and fundamental aspects of the injection molding production floor and molding process. Using state-of-the-art 3D animations, participants get a firm understanding of the inside of the injection molding process. The course also uses actual in-plant scenes so that employees and prospective employees gain an understanding of typical production floor operations. Safety around the injection molding production floor and machinery is emphasized throughout these lessons. The emphasis is on production efficiency, safety and teamwork. The course also extensively covers the fast and accurate identification of part defects. Give all your new employees a firm, common foundation from which to build their injection molding knowledge and give your current employees refresher training with Injection Molding Fundamentals. This course serves as excellent refresher training for veteran employees. 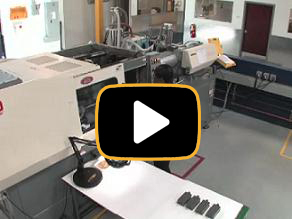 This lesson starts with an overview of the injection molding process, machine part identification and standard operator responsibilities during the molding cycle, modes of operation of the machine and the important aspects of material handling, Emphasis is given to operating safety, protection of molds from damage, and proper plastic part handling. This lesson presents visual and animated 3D examples of all of the most common injection molded part defects such as short shots, flash, warp, surface defects and color changes. It also discusses secondary operations such as regrinding, trimming flash and de-gating plastic parts from runners. Employees are taught to identify common part defects such as short shots, flash, warp, surface defects and color changes.